As the world goes to sleep. Not any attempt to hold the passerby spellbound. about getting crushed under walking feet. To pick you up gently. 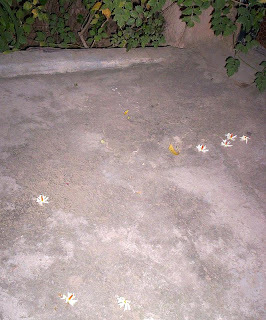 Note: Every autumn, the Shiuli, a small flower with white petals and orange stalk, blooms in different parts of India. 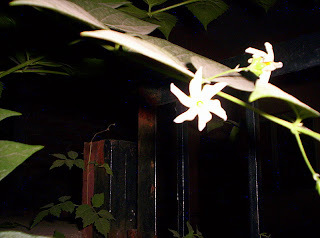 This delicate flower blooms in the dead of night and by morning, drops off the branches. 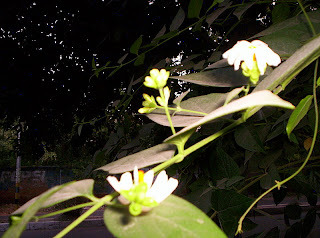 It has a soft, mild fragrance and heralds the biggest Bengali festival, Durga Puja. What a lovely post. Makes us take a minute to look at he wonders of nature. 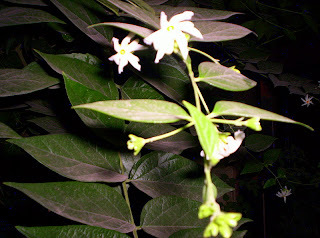 Lovely and delicate as the shiuli itself. That was beautiful. I didn’t know about that flower before reading your post. Very cool. Beautiful writing and photographs. Nice. Being a botanist I can appreciate this even more, though I have to admit I’ve never heard of the Shiuli flower. Lovely post! Beautiful picture! 🙂 Great lyrics. Loved before the world rubs its bleary eyes…. Sweet! Beautiful photos and words to match, Bhaswati. Thank you for sharing. Absolutely beautiful! I’m basking in the peacefulness you shared. That was beautiful – very poignant.Thank you for being such a wonderful blog buddy! I hope you and yours have a fabulous 2008!